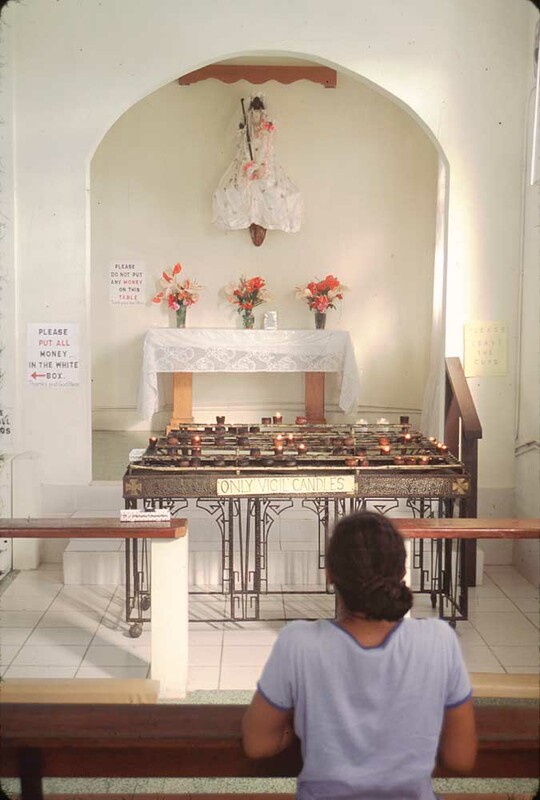 Late in the evening on Holy Thursday, just before the Christian feast of Easter, two middle-aged women make their way into the parish hall of the Roman Catholic Church in Siparia, in southern Trinidad. They take up their places in a slowly moving line that stretches out from an ornately dressed statue perched on a makeshift wooden altar decorated with a white cloth. The pilgrims remove several items from their handbags – olive oil, flowers, candles, and a few coins – and place orhnis (scarves) over their heads as they wait patiently for a few moments in front of the sacred image. Countless stories of miracles attributed to Siparee Mai circulate among her devotees, who will happily share their personal experiences of the Mother’s compassionate power. They worship Siparee Mai not only to ask for blessings, but also to give thanks. Narayan from central Trinidad comes with his wife and three teenaged daughters every year to pay respects to the one who has bestowed health and prosperity upon them. The statue is in the form of a bust on wooden struts, with jointed arms that can be moved, a common technique in Spanish baroque iconography. This gives the impression of a fully figured statue when dressed. The Mother of Siparia stands 2.5 feet high, and is made of African cedar, a dark, reddish-brown wood, which is covered with a thin layer of plaster of Paris that has been smoothed and painted. Only the face and hands show when the statue is dressed, and they have been painted a dark copper colour, which gives her an Amerindian or Indian appearance. The statue also has real, shiny black, straight hair, which many consider Indian or indigenous American in character. Her clothing is full of significance for her devotees, and every year she receives a number of new dresses as gifts. Dressing the statue has become highly ritualised, and is performed by altar ladies in the sacristy of the church; no men are allowed. In fact, many men who have grown up in Siparia tell the story of a young man, curious to see what La Divina Pastora had under her dress, who was immediately struck blind when he lifted her skirt to take a peek. The statue previously wore a crown made of gold offerings, but it was stolen in 1974, and its replacement is now kept in a bank safety-deposit box; it is brought out for her Catholic feast day, which is held after Easter. The Mother also holds a shepherd’s staff in her right hand, which is believed to contain a special power of its own. The Siparee Mai statue now belongs to the Roman Catholic Church in Siparia; but its history stretches back more than 250 years. The Siparia Mission was among a handful of missions established in the late 1750s (various sources give different dates) when the last band of Spanish Capuchin priests came to Trinidad through Venezuela to evangelise the indigenous Caribs and Arawaks. 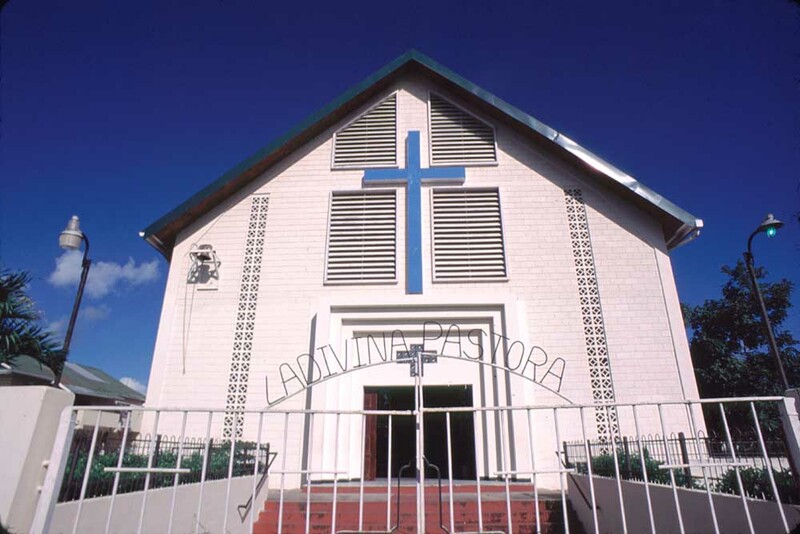 Siparia was made a Roman Catholic parish in 1906. 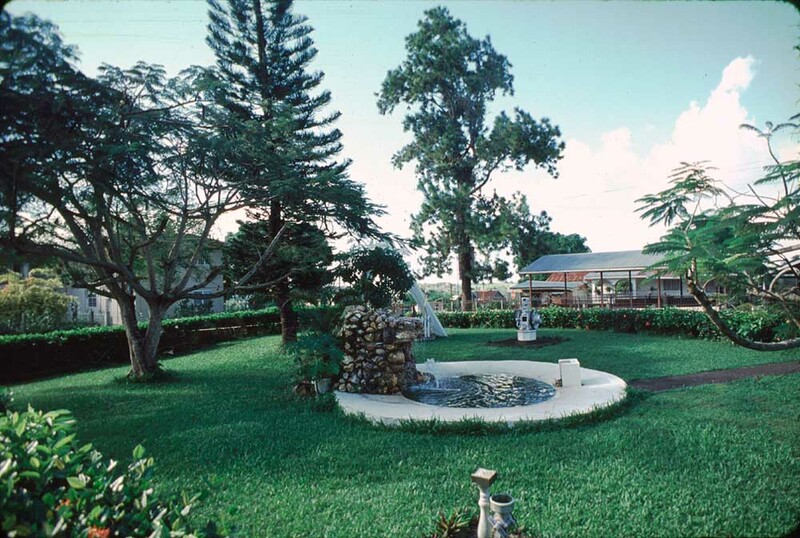 In the 1950s, an old caretaker reported that when she first came to the church at the turn of the century, the statue was on a dirt mound in the centre of the church and was being tended by a Carib woman. At that time, Trinidadian “East Indians” were already venerating the image by offering rice, oil, flowers and coins. 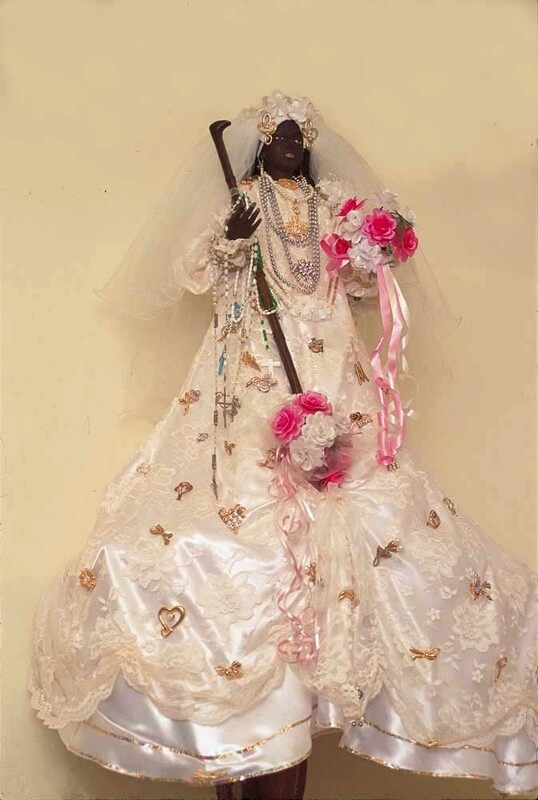 It is believed that people of Indian descent began making pilgrimages to Siparia in search of this dark Madonna’s healing power in the late 19th century, soon after their arrival in Trinidad. Approximately 144,000 indentured labourers were brought to Trinidad from India between 1845 and 1917 to supply cheap and disciplined labour for the colonial sugar plantations. By 1890, the statue was attracting large numbers of indentured workers, mostly Hindus, but also some Muslims. 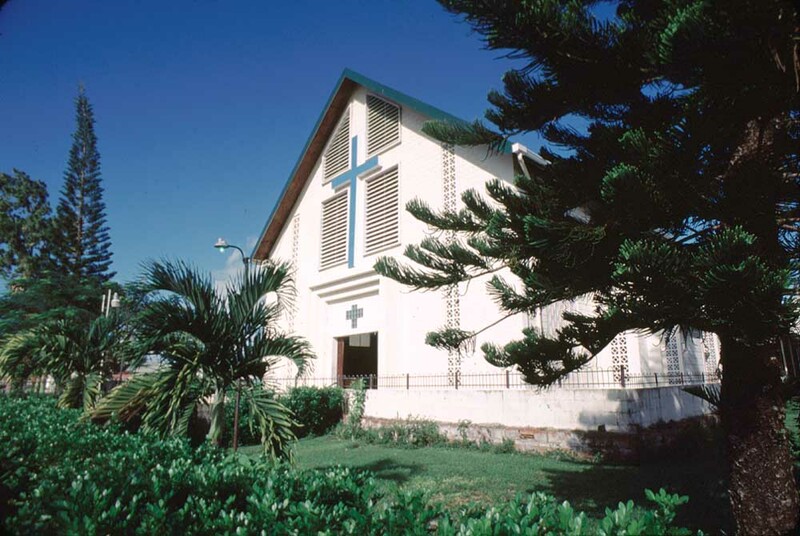 “East Indians” were then a minority in Trinidad, and many of their social practices were looked down upon with contempt; so it is remarkable that they had already established a pilgrimage to Siparia, as Father Cornelius O’Hanlon’s parish records of the 1860s attest. Equally remarkable are the many different stories that have been offered through the years to account for the origin of this miraculous statue. The simple fact is that no one can sufficiently account for its presence. Varying narratives of the Mother’s origin reflect the ethnic and religious backgrounds of her devotees. The Chinese, who also came to Trinidad as indentured labourers, initially saw the statue as Guan Yin, their East Asian goddess of maternal compassion, and they brought her offerings of tapestries, vases and lamps. But these devotions were quickly lost as the Chinese adopted the Catholic approach to her devotion. Catholics trace the statue’s origin to the Capuchin Catholic monastic order which came to Trinidad through Venezuela in the mid-18th century, and whose special patroness was proclaimed to be La Divina Pastora by Pope Pius VI in 1795. Surgeon-Major D. W. D. Comins’s 1893 Report on Indian Emigration to Trinidad reported that Capuchin monks fleeing persecution in Venezuela brought the statue to Trinidad in 1730. A related story states that a ship carrying a group of Spanish Capuchins in the 1870s was wrecked while passing through the channel between Trinidad and the mainland; the only survivor clung to the bow of the boat, and when he washed ashore at Quinam Bay (seven miles south of Siparia), he saw that the figurehead on the bow was the Divina Pastora statue. Other stories claim the statue is the prow of a Warao canoe, or that it represents an Amerindian girl who saved a Catholic priest’s life. Some Siparians say that the Warao, fleeing persecution from a warrior tribe, brought the statue to Trinidad and hid her in the forest, where they searched unsuccessfully for it. Later, when it was recovered, it was brought to the Siparia mission. Still other tales locate the statue’s origin in Trinidad itself. Several claim that it was discovered in the ground by a woman working her dasheen patch, and that it bled when it was accidentally nicked with a hoe. Other variants have the figure being found by men cutlassing in the bush. Many believe Siparee Mai was born from the sand of Siparia (Siparia means “city of sand”.) In each of these cases, she springs immediately to life from the earth itself. It is therefore not surprising that the statue goes by many names. She is Siparee Mai, Mother Durga, Mother Lakshmi, Mother Mary, La Divin, and Sita (Rama’s wife from the Hindu epic, the Ramayana). And since the 1890s at least, she has been identified as Mother Kali, the great Hindu goddess who saved the world from demons with her cosmic dance of blood-thirsty destruction. Just as the Mother is called by many names, she is worshipped with an array of different offerings. Pilgrims typically bring rice, flowers, olive oil, candles and money to bestow upon Siparee Mai in supplication and thanksgiving; sometimes they bring jewellery, but not as much as before. They also make aarti to her — a respectful offering of lit flame — and touch her arms and feet, and then their foreheads, thereby transferring her power to themselves. The candles are used by the church, while the money is used to augment parish finances or is distributed to charities. The olive oil bottles are half-emptied by church assistants into large containers and then returned, half-full, to expectant devotees, who use the oil to anoint themselves as a cure-all throughout the year. The generosity of the pilgrims extends to the beggars who congregate in the churchyard, and who receive alms from the devotees making their way to the Mother. Part of the Siparee Mai pilgrimage is the practice of having a child’s first haircut on reaching the church grounds. This traditional Hindu rite of passage (called mundan samskaar) is believed to be auspicious when it is done as part of the devotions to the Mother of Siparia, and is believed to bestow health and well-being upon the child as he grows. As a result, a few barbers have set up shop near the various gates into the church complex. It is also believed that a child’s first haircut during the Siparia devotions will cause him to begin to talk, if he has not already done so. Immediately outside, lining the main streets that border the church grounds, are market stalls selling religious paraphernalia, food, trinkets, Indian delicacies, and various commodities such as towels and ceramic pottery. Except for a colour photograph mounted behind a cheap piece of glass, few souvenirs of the Mother are sold in the market, either during the devotions to Siparee Mai, or later during the Catholic processional feast. 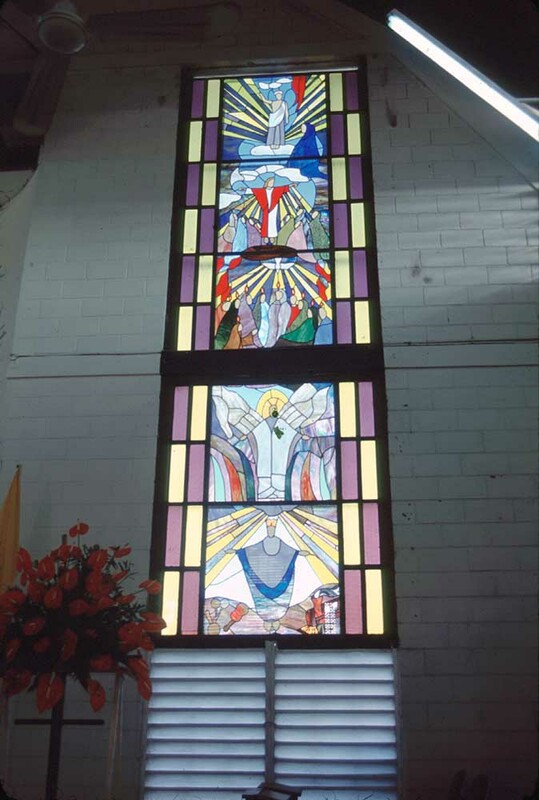 The Catholic feast day of La Divina Pastora, The Holy Shepherdess, was traditionally held on the second Sunday after Easter, the day established by Pope Pius VI in 1795 in her honour. A few years ago, in 1992, when the church calendar was reorganised, the feast day was changed to the third Sunday after Easter, which caused some confusion among pilgrims. High Mass at mid-morning is followed by a procession through the streets of the town with the statue, which is specially dressed in new clothes for the occasion. In times past the statue was carried manually through the streets, but since 1993 it has been carried on the roof of a car because of the large crowds. During the procession, the Rosary is recited, followed by the Litany of the Blessed Virgin. Marian hymns are sung in devotion to the Mother. Sacred activities on the Virgin’s feast day are followed by a massive fete, Trini-style. Many people around the island simply refer to the entire day’s events, religious and otherwise, as “the Siparia fete”. Hordes of people crowd the streets of Siparia, drinks in hand, music blaring, ready to while the night away in the spirit of party. In the early 20th century, the Catholic feast grew into a week-long fete that included cycling, horse racing, carnival rides and other sporting events. This fete became known as Trinidad’s “little carnival”. Older Hindu devotees say that the festival for the Mother of Siparia was holier in days gone by, and that modern Carnival feting has destroyed some of the spirituality associated with the devotions. These issues raise important questions about the festival’s future. The number of pilgrims in recent years seems to be falling, though the larger concern revolves around whether the younger generation will keep up the devotional practices. There is also competition and criticism coming from some Evangelical, Protestant and Pentecostal churches, who erected a big doll on Quinam Beach in an attempt to redirect people away from the image in Siparia. The Mother’s detractors are found even within the Hindu community itself. Though popular, the Siparee Mai pilgrimage is perceived as an aberration by some orthodox Hindus, who perceive her veneration to be in conflict with the tenets of Hinduism, and who regard such devotion as “superstition”. 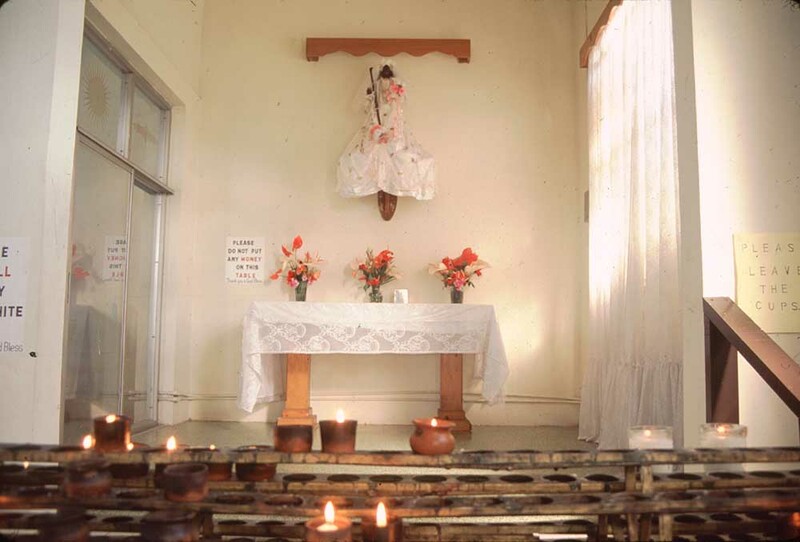 The devotional practices that have grown up around Siparee Mai/La Divina Pastora are characterised by what theologian Gerald Boodoo has called a “hesitant respect”, part harmonious, part conflict. But devotees continue to believe in her powers, and take their prayers to her.